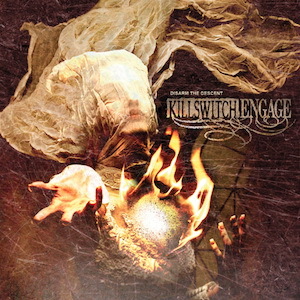 Nothing against Killswitch Engage but they had kind of fell off of my radar prior to the release of Disarm The Descent. It’s not as if they were terrible or anything but by the time we got to the self titled KSE CD I had really lost interest. When the news came out that Jesse Leach had returned to the band I found it exciting as he had always been my preferred vocalist. Let’s get into the record. Well alright!!! Right away you are punched in the chest by “The Hell In Me” and the pummeling does not stop until “Time Will Not Remain is over, leaving you breathless and wanting more. KSE is back, and in a big way. These twelve tracks are brutal and yet melodic at the same time. Upon subsequent listens there is so much to be found in the layering depths of this CD. It seems as if new life had been breathed back into KSE. It also seems as thought the band has matured in their songwriting and playing style. The album was produced by Adam Dutkiewicz and mixed by Andy Sneap. I, for one, am glad to see KILLSWITCH ENGAGE back to kick our asses into oblivion!!!! This entry was posted in Artist, Bassists, Classic Metal, Drummer, Guitarists, Heavy metal, Internet Radio, Metal, Music, Rock, Rock N' Roll, RockStar, Tattoos, Thrash Metal, Wornstar Clothing and tagged Adam Dutkiewicz, Andy Sneap, Bleach Bang, Bleach Bangs, Bleach Bangs Radio, Charlie Owens, DarkicoN design, Disarm The Descent, Hard Rock, Heavy Metal, Howard Jones, Jesse Leach, Jim Fogarty, Joel Stroetzel, Justin Foley, Killswitch Engage, Metal, Mike D'Antonio, Music, Randy Norris, Rock, Rock N' Roll, Rock Star, RockStar, the Hellion, the Hellion Rocks. Bookmark the permalink. ← the Hellion interviews THROW THE TEMPLE on Rock U-Night!! !